The second half of June has been glorious sunny weather which is set to continue through the weekend and hopefully beyond. So this is a good time to remind you that not only do we sell luxury Brymor ice cream in cones from the scooper but we also stock 30 favours to take out and enjoy at home. The Clotted Cream favour goes well with strawberries. My favourites are Ginger, Mocha Almond Crunch and Rhubarb Crumble. Keith just loves the Vanilla. Available in 1/2 litre, one litre and two litre. If you want a four litre pack or would like the Brymor sorbet we can order it in for you. we get a delivery from the parlour every week. When Keith and I moved to the shop we brought our two Jack Russells, Kip and Tanner, and their best friend Ginny the pussycat (who thought she was a Jack Russell). Sadly three years ago we lost them all to old age and illness. 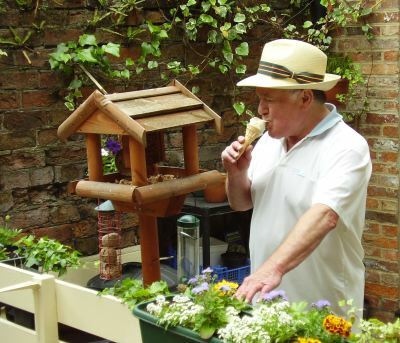 With the shop taking up so much of our time we thought it would be unfair to bring a new kitten or puppy into our lives and instead we encourage the birds of Boroughbridge into the yard at the rear of the shop. 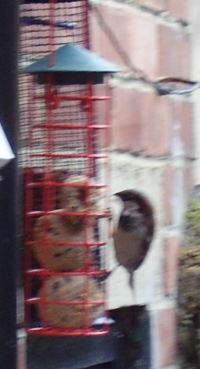 The first regular visitor was a slender sparrow we have nick named Slim Jim. He has since been joined by half a dozen more who appear more rounded so he is still easy to pick out. Another regular is Joe Black, the blackbird. He arrived one sunday with a large portion of pizza from Fishergate. It took him nearly a week to finish it and in that time he realised that we were putting out bird seed, peanuts, fat balls, brown bread and fruit. So he calls several times everyday. Other birds attracted to the yard are doves and a couple of large pigeons that remind me of B52 bombers. 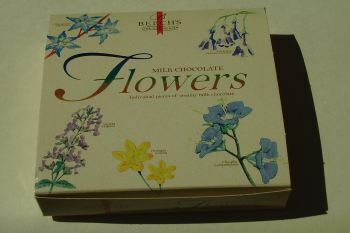 The Beech’s fine chocolates I mentioned in my last blog are now available on my website www.annessweets.com They make a perfect little gift for birthdays, exam success or just to let someone know you are thinking of them. Why not visit the site and while you are there check out the traditional weigh out sweets that are also available.